Cindy draws with thread. It is a slow and meditative way to express herself. It is very tactile. 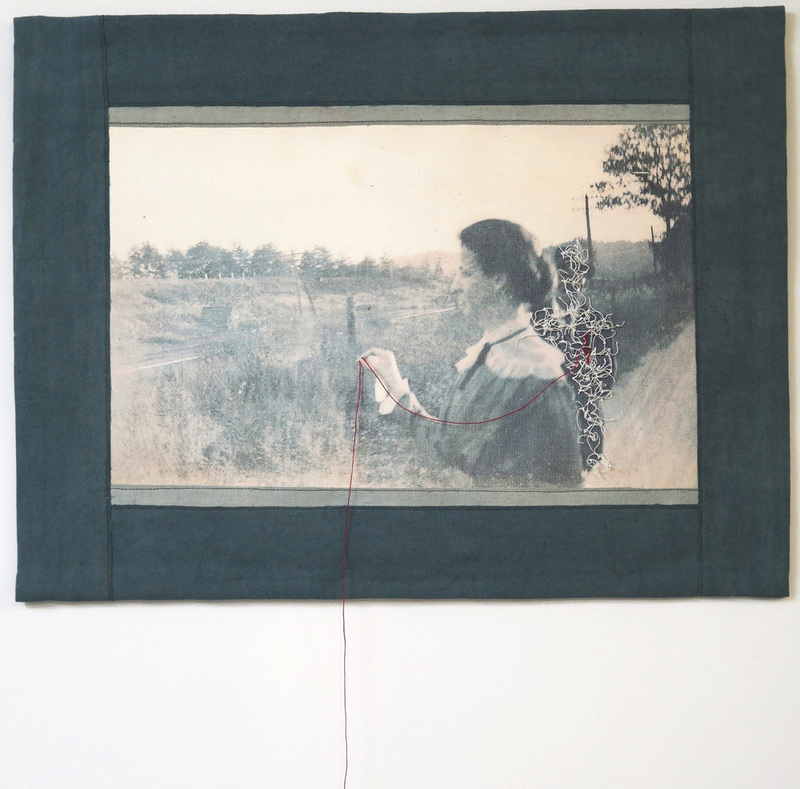 Embroidery has a long history, and placing herself into that continuum gives her a feeling of comfort. Making art gives Cindy a voice to communicate thoughts she can’t put into words: the complexity of love and relationships, death and dying, disappearing. It allows her to tell her story. Saudade is a Portuguese word that is used to describe an intense longing and deep melancholy that accompanies the absence of a person or time and place that is loved and irretrievably lost. Cindy learnt this word during a residency in Portugal, and it encompasses a kind of beauty as well as the sadness and ache of loss. 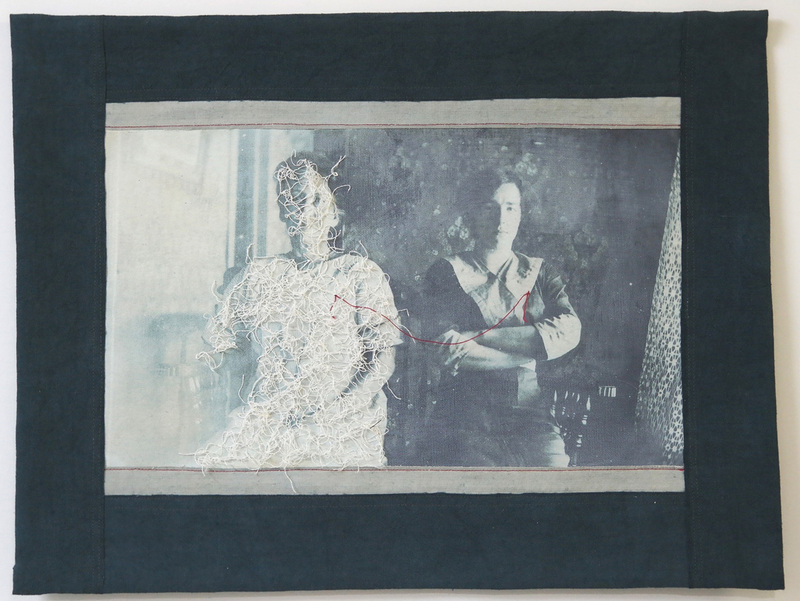 The work in the series Saudade uses painted and embroidered found photos on canvas, framed in hand-dyed fabric sourced from antique French bed sheets, to try and reflect some of the nuance and complexity of the feelings the word Saudade describes. The series Forgotten is a collection of 19th Century cabinet card photographs of unidentified female subjects. Their bodies and clothing have been hand-embroidered using threads made from both natural fibers and metal. This series celebrates these forgotten women, hopefully breathing new life into their photos so they can once again be appreciated. Cindy is fascinated by words from other languages that give a name to complex emotions and beautiful moments. Words like saudade, sehnsucht, fernweh, trouvaille and many others. Words not part of her native tongue. Whilst in Corris Cindy wants to work on a series of pieces that are visual interpretations of these foreign words with no direct translations in English. She will create these visual translations with a mix of alternative photographic processes and traditional textile art techniques.